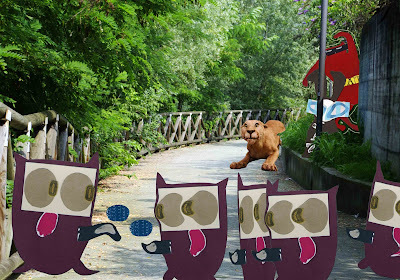 After a hearty breakfast, the Puma and Skratch led the Wabbit to the river trail. Skratch indicated a suitable spot and they took up position. Then he scratched his head and pointed. "Wabbit, what's that for a sort of creature?" he asked. "They have No Name," said the Wabbit. "But what are they doing here I wonder?" "It's something to do with the blue discs," said the Puma. "They appear to be very happy to get them," commented Skratch. "Shall I pounce?" asked the Puma and he growled, "they won't be so offensively happy then, will they?" "We must be more strategic," said the Wabbit. "We should keep them in place and see what happens." “I have an idea," said Skratch "Out with it, Skratch." whispered the Wabbit. "Let's follow them. It won't be hard because they look none too bright," said Skratch with glee. "What then?" asked the Wabbit. "We take all their stuff," said Skratch. The Wabbit shook his head. "We will follow them to watch where they go with the discs," he said and addressed Skratch directly. "Cut a straggler from the rest of the group and befriend it." "With jokes?" asked Skratch. "If you have good ones," said the Wabbit. "What about me?" said the Puma. "I have something in mind for you," grinned the Wabbit. The three quietly watched the happy band drift off along the river trail and their paws made scarcely a sound as they followed. "A funny thing happened to me on the way to the River," practiced Skratch.